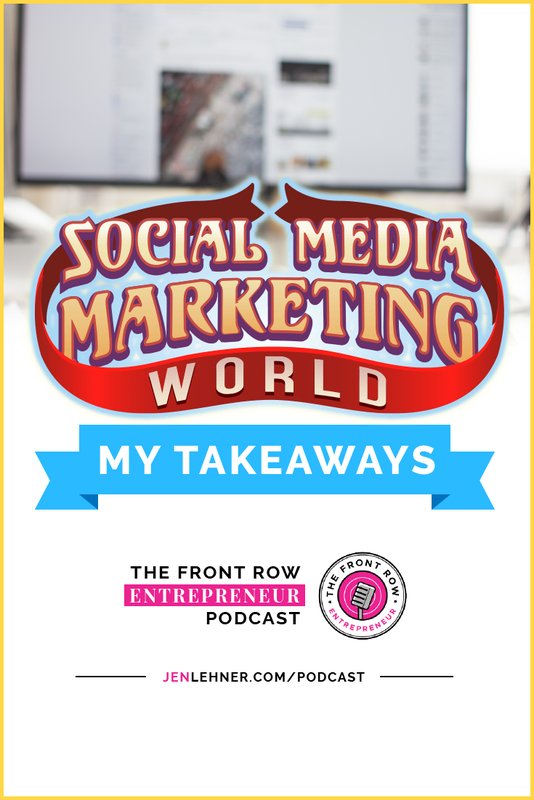 I just returned from Social Media Marketing World in San Diego and in this blog I thought I would share with you what I learned. Now, the thing about this conference and so many conferences is that for every one session you attend there's like a dozen others that happen at the same time. This is just a small slice of the conference from my very singular vantage point. If you're a regular listener of my podcast, The Front Row Entrepreneur, as regular as you can be when they're only 10 episodes, you know that I have this thing about the front row literally and metaphorically. Metaphorically having a front row mindset means you're ready to step up. You want to see and be seen. You aren't wasting time being half-assed or non-committal. You're all in and literally, I believe that sitting in the front row like at a conference is really key to your enjoyment of the conference. When you sit in the front row, you see and hear the speaker better and there are a lot of other advantages as well. Let me give you a couple of examples. I attended this really exciting YouTube session led by this man, brilliant marketer named Billy Gene and of course I was sitting on the front row and at some point, he asked a question and asked us to shout out the answer. I shouted out my answer and while there might had been others in the room who shouted the same thing, I'm the person he heard first cause I was in the front row. After hearing my correct answer, he surprised me with a nice crisp $100 bill. No kidding. In other sessions there were times when I wanted to meet the speaker afterwards and of course being closest meant I was the first in line. You know how after someone talks and especially if they're super engaging, then people go up to the front and they sort of stand in a queue to meet the person who was speaking. I didn't have to wait in that line because I was first to get there. At the closing keynote, Pat Flynn asked a question about new kids on the block or in sync. I don't know, one of those boy bands who I guess are still together and the woman in the front shouted out the right answer and Pat surprised her with two VIP tickets to Las Vegas to see whoever that boy band was. And finally, I've noticed that when I sit in the front row, the people who are sitting beside me or like-minded, they're go-getters. At each session, I think I really did my best networking just talking to the people on either side of me. The conference head Honcho and CEO of social media examiner, Mike Stelzner, opened up the event with a keynote that was basically the equivalent of dumping ice water on our heads but it was a good thing. It was really, I think the wake-up call we all needed to hear because he was talking about the Facebook algorithm and what these changes are likely going to mean for us who rely on Facebook to help fuel our businesses. He reminded us that Facebook flat out told us that we're going to see for sure if you haven't already a decrease in traffic across all of our Facebook business assets, groups, messenger, your Facebook page, everywhere. But he not only gave the audience a glimmer of hope. I've found myself so excited. I was ready to jump out of my chair because he said, and I agree that small is the new big, meaning, a smaller, more relevant and engaged audience is more valuable than a larger, less engaged audience. Facebook wants to see repeat viewers to our content and by content, he really was referring to videos. He said that it's time to go all in on video, specifically short-form video storytelling is the future. He said, and he told us to start thinking about creating episodic content like your own show and Mari Smith session, which I'm going to talk about more in a minute, but she echoed this and also encouraged us all to go ahead and fill out our applications for Facebook Watch now, even if we don't already have a show, to do this, just search Facebook Watch application in the search bar and you'll see it. Also worth mentioning. Stelzner said that vertical video with the sound on is the most watched video of all right now. I attended a few podcasting sessions, but even if you aren't interested in podcasting, you might appreciate a few of these takeaways. In another podcasting session with Michael O’Neal, who hosts the Solopreneur Hour podcasts. I learned a lot of great new things. First, if you're thinking of doing a podcast, do a search and see if it's trending, where the audience is and what do they want to know. He gave an example of this dentalpreneur podcast where a dentist shares marketing tips with other dentists and it's really hugely popular and he also reminded us that as podcasters we can often get media passes to conventions and conferences that are in line with our podcast topic. I had never knew that then he gave some really great interview tips like make sure you pronounce your guest's name correctly by searching YouTube for videos of that guest saying their own name or whatever video. I thought that was a great tip and he says before your interview, look through social media to learn a little bit about them personally and find something they love that isn't related to their business. Do they love sailing or scuba diving? Just something so that when you begin the conversation, you can start with that and then this opens them up for the rest of the interview. He recommends jumping on video, first degree your gas, but then switching to audio only since audio only is really much more intimate for listeners and he said that his interviewers, it's up to us to ask what they're promoting and to get their appropriate links. We should not make our guests have to promote themselves. We should do the promoting. I thought that was really interesting. You know, I'm a new podcaster. I've only done a handful of interviews, so this was very enlightening to me. I also thought it was interesting that he said that the last thing out of our mouths when we introduce our guests should be their names and that he pointed to like talk show hosts the tonight show, whatever, where that's how it's done. So you would say, “Ladies and gentlemen, bestselling author, blogger extraordinaire and founder of Blah Blah, blah, Seth Godin”, I guess it makes the person's name more cemented in the listener's ears. He said that the time to ask guests to promote your show that they were just on his right after the interview, because they're all feeling good that the interview went well so you say, “Hey, would you be willing to share this podcast with your audience?” And usually, he said, they'll say yes and then on the day that is published, you send an email and say, "Hey, here's the podcast. Thank you so much for promising to share it with your audience. I appreciate it." He said that word promising is key. I don't know. I don't know if I've got the guts to do that, but I bet it does work. Another podcast panel I attended really sparked some ideas for me, Gary Leland, co-founder of podcast movement. He was on this panel and he shared how he finds a niche and a product. Then he creates the podcast as a marketing vehicle for the product. For example, he found a wallpaper company or his wife had this wallpaper company that she just loved and then he started a podcast called fixer-upper and it's aimed to do it yourself first and he has all sorts of do it yourself guests like people who specialize in different kinds of do it yourself projects. But throughout the podcast he promotes the wallpaper on his show and he says he's got another podcast that is all about women's fast pitch softball, I guess he's like a big um, softball enthusiast, fast pitch softball enthusiasts and he sells sporting equipment on that podcast. There's no other sponsors, just his product and I thought it was interesting. We tend to think of the topic first and then figure out how to monetize it, but he does it in reverse and apparently, he's doing really well. In the YouTube session with Billie Gene, he said his favorite type of YouTube ads are in-stream ads. He really wanted us to know that creating custom audiences on YouTube can be done just like on Facebook. You can upload your contacts and target them directly plus everybody is advertising on Facebook, not so much on YouTube. He says we're overlooking a huge opportunity. I do plan to definitely dive into YouTube ads in the near future and I'll keep you updated on that. In Mari Smith's Facebook session, she pointed out that there is still a profound opportunity for marketers. So this was sort of the antithesis to the ice bath that we got with Mike Stelzner, but she says 70,000,000 businesses have pages on Facebook and only 6,000,000 of those people are advertisers. Other interesting tidbits that she shared with us are Facebook lives get six times more engagement than regular video. She said Instagram is Facebook's next Facebook. She was saying that it inside Instagram we can make in-app purchases, which is really huge when you advertise on Instagram. The swipe up feature is available even if you don't have 10,000 followers. She said that the boost button boost post button is coming to groups, but actually a lot of people already have. My Assistant, Neeca, already has this feature in the Philippines, so I don't know if it's going to be a good thing or a bad thing. I am looking forward to trying it. She told us to keep our eye on WhatsApp, you know, WhatsApp is owned by Facebook and in China they do everything inside of WeChat. WhatsApp is the Messenger App of choice in the rest of the world. Facebook owns it and she said there's going to be a lot of opportunity for us with WhatsApp. We need to keep our eyes on that. Then she talked a lot about the episodic content and Facebook Watch and when she asked people in the audience how many people were watching that unique programming on Facebook, only about like 12 people in the room raised their hand and she said that next year she guesses that like 60 to 70 percent of the room will be raising their hands because it's just that they're moving fast with this Facebook Watch and they're coming for Netflix, YouTube, Amazon and Hulu. They want original content, dedicated eyeballs, and Facebook's advantage over all those others is that it's built on a social platform. She said there's going to be a huge increase in exclusive streaming rights. She gave the example of how the India Premier Cricket League, Facebook bid to have the live streaming rights, $600,000,000 and lost to Rupert Murdoch at who bid $2,600,000,000 for this one event, Cricket. Why is all this important? She said that Facebook right now is where YouTube was eight or 10 years ago. We don't see it yet because they're still trying to find their way, but they're going to get there, she says. She also recommended that we start thinking more like screenwriters not like buy my stuff, copywriters and like Mike Stelzner, she said, we need to be focusing on episodic content. She said to win, we need the right strategy, the right tools, the right templates, the right content, the right targeting, and the right engagement. With regard to messenger and bots, she said that she was worried because when the quote, when the marketers move in, the members move out and she stressed that when it comes to conversational commerce, I really liked that phrase, conversational commerce. It's all about how you make people feel. I agree. She says to act, think and feel like a member first and a marketer second. I agree with that whole-heartedly. Relationships first, business second. Yes, yes, yes. Pat Flynn's closing keynote was fantastic. If you don't know Pat Flynn, he's the creator of smart passive income and you'd be hard-pressed to find anybody who just doesn't absolutely adore him. He's so likeable. His talk was all about creating super fans by really loving on your peeps and also creating experiences for them and surprising them from time to time. I have to say this has been my mos is the beginning and while I'm no Pat Flynn, that has worked really well for me. When you genuinely love what you're doing and the people you are servicing, it's actually not something you really have to think about. Is it? And aside from his awesome dance moves and just overall adorableness, my biggest takeaway was a tool that he mentioned called Bonjoro. It's a tool that allows you to send personalized video messages to your peeps. He gave this example of how ConvertKit does this and I think they have like one person and that is just his dedicated job. Every time someone signs up with ConvertKit, they get this email, they get this video and it's personalized. It will say like, "Hey Chuck, this is bill over at ConvertKit. I noticed you signed up with us. Thank you so much for putting your faith in us. I took a minute to go look at your webpage and I see that you run your website on a WordPress site and so I've attached a tutorial video that shows you how to easily connect, ConvertKit with WordPress and if you have any questions or you know, just hit reply on this email." and man, I mean what a great touch. He showed a graph or a bar chart of the correlation of how long people stay with ConvertKit since they've been doing this a compared to how long they stayed with ConvertKit prior to that, people would sign up for the free trial and drop off before they ever really implemented and actually subscribed and upgraded. I thought that was really compelling. There are other free apps that do this, but what I'm learning with this app in the short amount of time that I've been experimenting with it is that it allows you to integrate with your CRM. When someone purchases something from you or opts into your list, the APP creates a checklist for you and then you can quickly move through the checklist and send these personal messages to people. I have to say that as great as this conference was, and it really was, my favorite thing was meeting so many of you in the front row. We had a lot of people show up at our Front Row meet up for dinner, and it was just a blast to meet people in person who I've only known virtually up to this point. It's sort of surreal actually. If you aren't yet a member of my free online classroom, the Front Row, please head over to frontrowclassroom.com and join today and that link will take you there. I'll let you right in.